Q: How did Take Back the Tech! get started and how has it evolved? APC has a women’s rights program that focuses on several different areas related to tech and gender and Take Back the Tech! is one of those. It came out of APC’s research findings from on access to technology and experiences with technology. They found that there was a real problem with gender-based violence through technology that wasn’t being addressed – especially at a global level. Take Back the Tech! 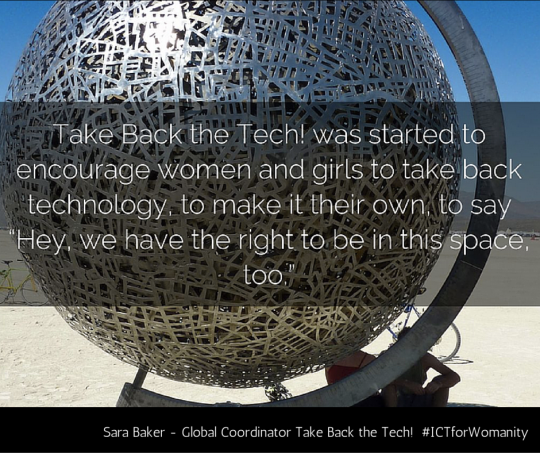 was started to encourage women and girls to take back technology, to make it their own, to say “Hey, we have the right to be in this space, too.” It started as a collaborative campaign with people from different countries and since then, it’s grown to well over 30 countries. We really want to push the discussion around access, freedom of expression, and violence against women worldwide, but a little bit more in the global south, where the issues are more pressing. It’s amazing to see how much it’s grown and how much attention it has received. Last year, we did a campaign focusing on the private sector, including platforms like Facebook and Twitter, trying them to get them to really understand the experiences women were having on their sites. That really got a lot of media and international attention. This subject is on the table now – it’s great to see people really starting to talk about this now at higher levels. 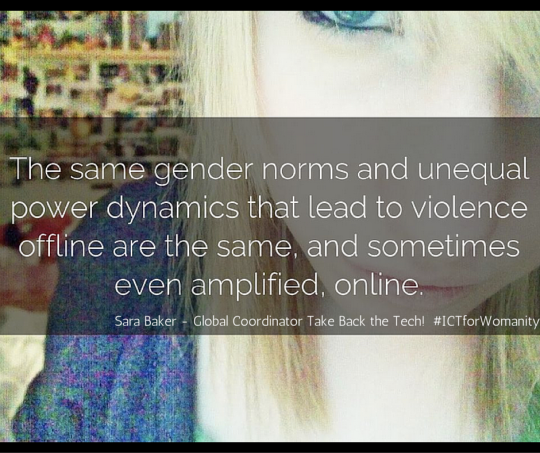 Q: Where do the online and offline worlds intersect when it comes to gender-based violence? I think people have this idea in their heads that the internet is a totally different world from the offline world and that the things that happen there are separate. That’s just not true. The line is often invisible, non-existent, or blurred. We face the problem of getting people to see that online violence is violence, part of the overall continuum of violence, and not something separate. The same gender norms and unequal power dynamics that lead to violence offline are the same, and sometimes even amplified, online. People can experience violence from the same person online and offline. Technology plays a big role in intimate partner violence through webcams, social media, controlling mobile phones – there are many more avenues than there used to be. We have a map on Take Back the Tech! where people can report violence and you can see the line between online and offline blurring. Online violence is just like any other psychological form of violence. It affects people’s daily lives. We are trying to get people to see what happens to women online as part of this continuum of violence. That’s especially true for younger adults – they will definitely experience both. Q: It seems that often those who have the least access to technology are the ones that are most marginalized. How does access (or lack thereof) figure into efforts using technology to help more victims? Two hundred million fewer women are online when compared to men. Even when victims don’t have access to technology, they can become victims through technology. That’s most frequently seen with cell phone cameras used to film or photograph women without their consent. Take Back the Tech! tries to train women in digital safety and digital security to keep them safe once they have access. We also run FTX, the Feminist Tech Exchange. A lot of tech folks may not understand how much gendered elements impact tech and there are a lot of feminists and women’s rights activists that are doing great work, but don’t know how to use a lot of technology. This initiative brings them together to get them working together. Q: Take Back the Tech! has become a hub for people to connect and create inclusively – how does this generate solutions? Women have been excluded and discriminated against in the tech world for so long and those that have been there feel a real lack of support. I think when you bring them together, it creates a support system, there are people recognizing and fuelling their ideas, celebrating the role of women in tech. 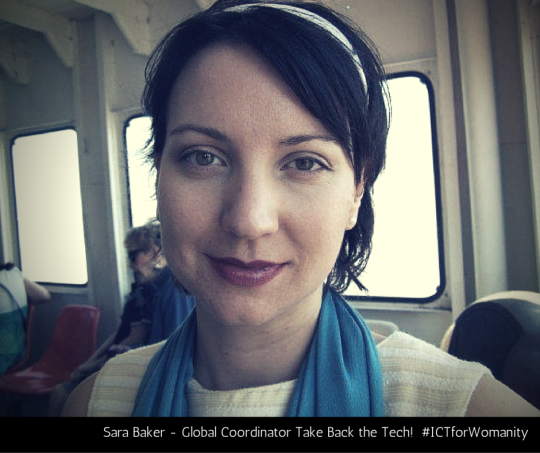 A lot of people see tech as a masculine thing and when we come together, we’re challenging that. And when we challenge that, we’re also challenging the dynamics that create violence against women. All of these issues are intertwined. We can’t address violence without addressing access or the role of women in technology or things like internet governance. Q: How has this work had impact on your personal journey as a feminist? When I started working with APC, my background was in gender-based violence and I understood to some extent the role that technology was starting to play, but I was not really a tech person. Working on Take Back the Tech! has been an amazing learning experience for me. I have a much deeper understanding of technology and its gendered aspects. Technology is part of our daily lives – almost every minute – and now I understand how the issues I was working on play out online. The biggest change for me is that I’m not just a gender-justice advocate, but I am an internet rights activist and a communications rights activist.